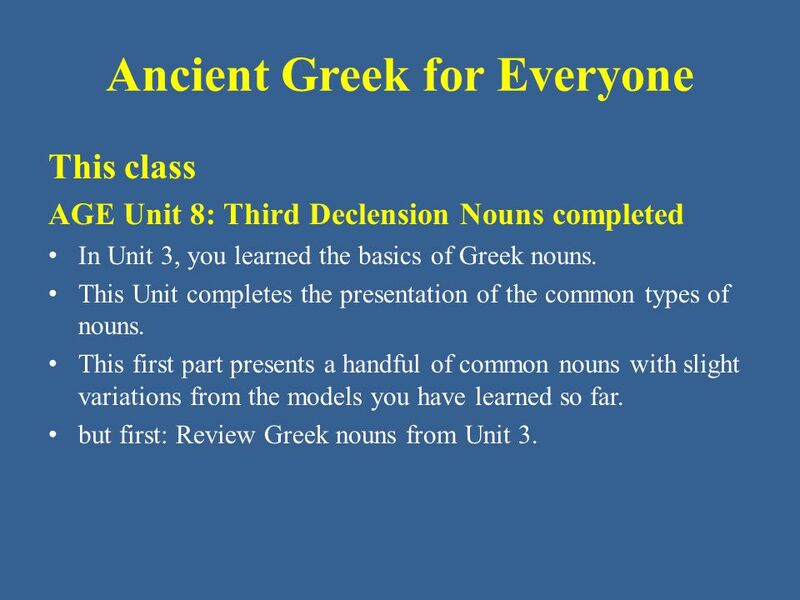 2 Ancient Greek for Everyone This class AGE Unit 8: Third Declension Nouns completed • In Unit 3, you learned the basics of Greek nouns. 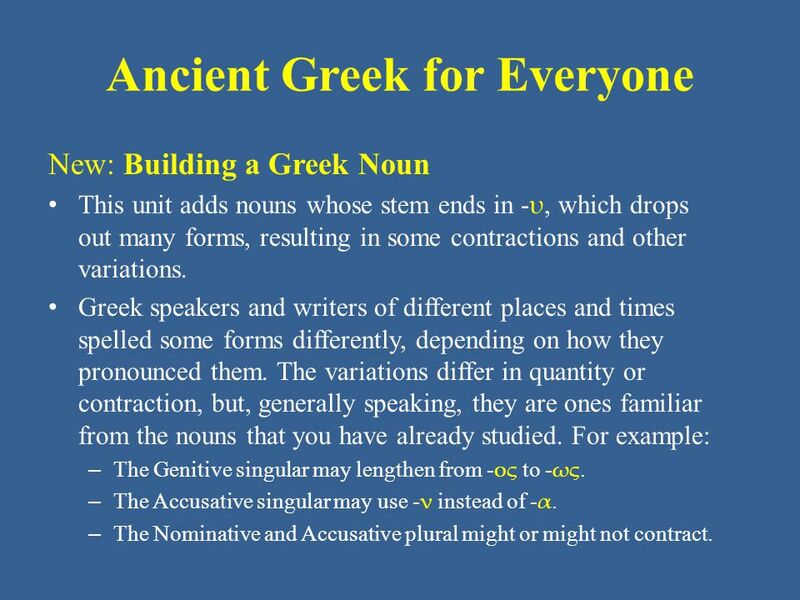 • This Unit completes the presentation of the common types of nouns. 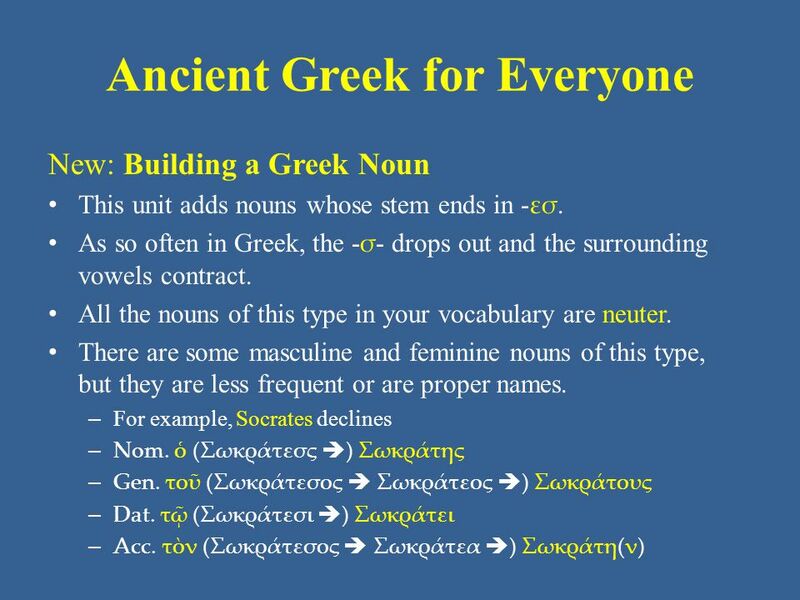 • This first part presents a handful of common nouns with slight variations from the models you have learned so far. 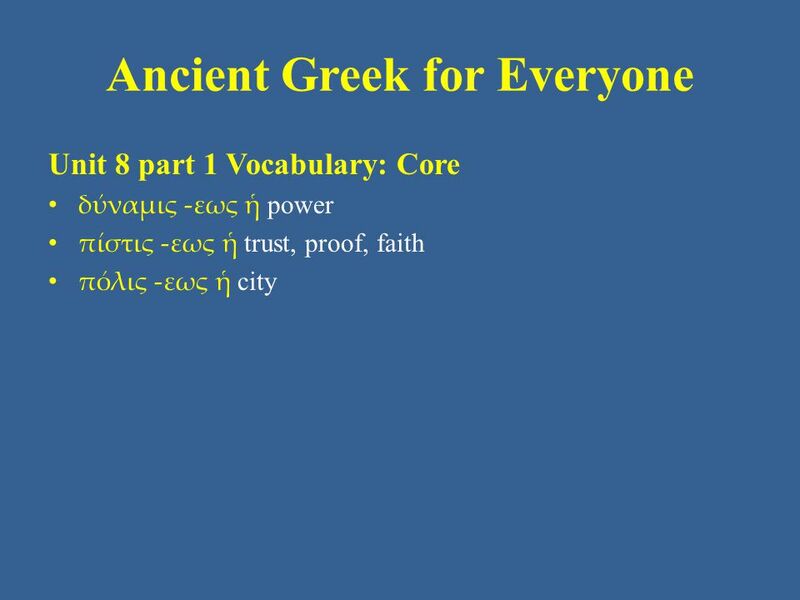 • but first: Review Greek nouns from Unit 3. 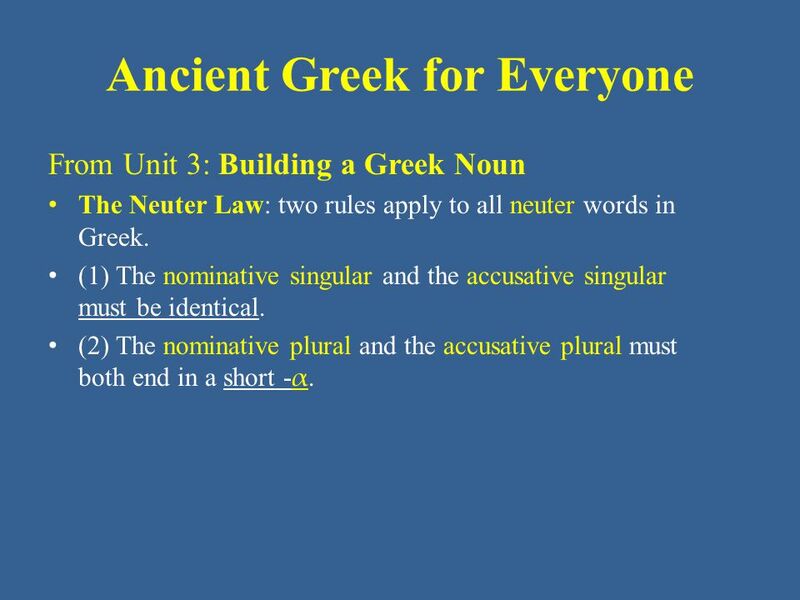 9 Ancient Greek for Everyone From Unit 3: Building a Greek Noun • The Neuter Law: two rules apply to all neuter words in Greek. 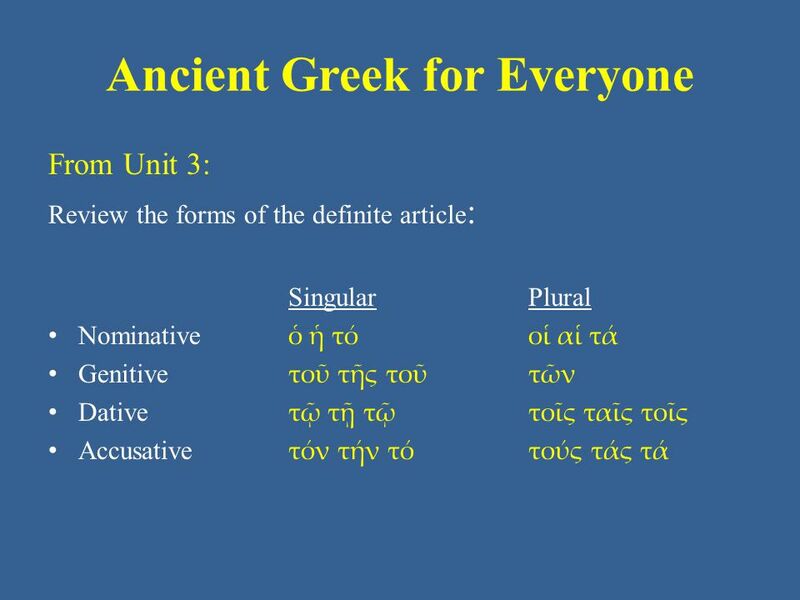 • (1) The nominative singular and the accusative singular must be identical. 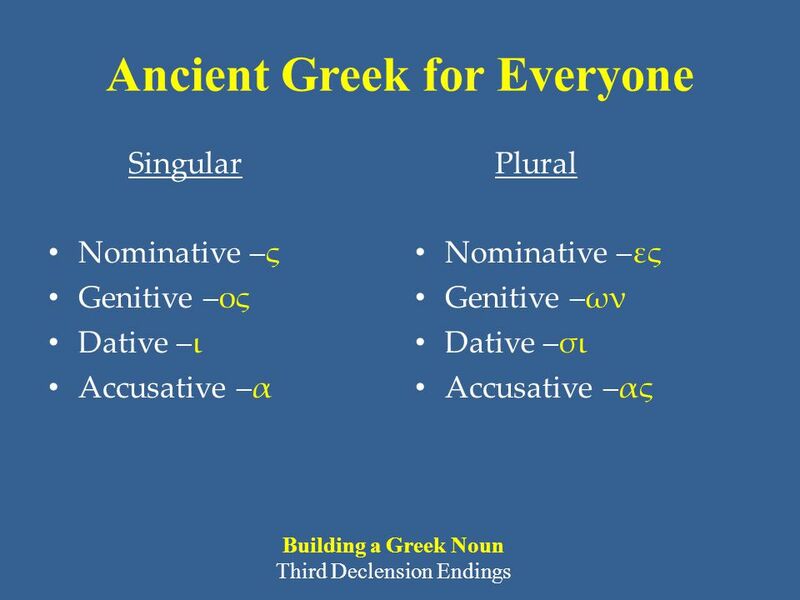 • (2) The nominative plural and the accusative plural must both end in a short - α. 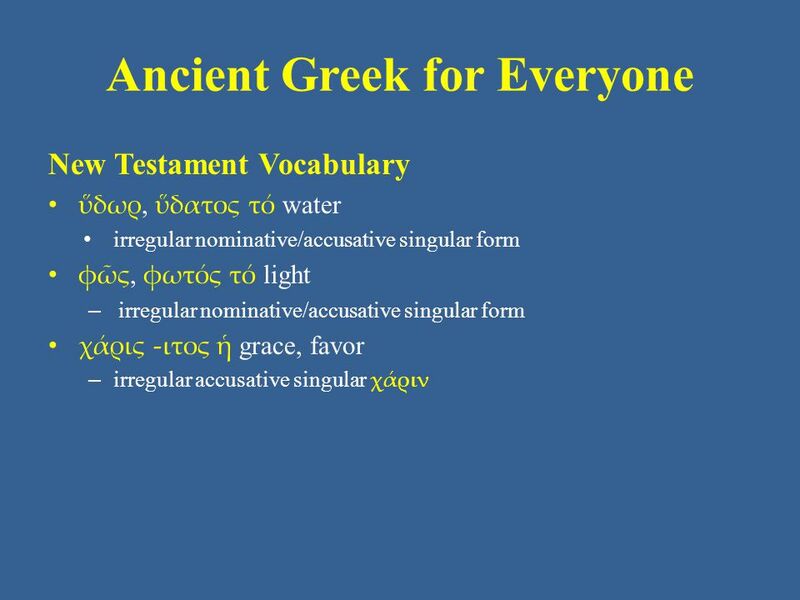 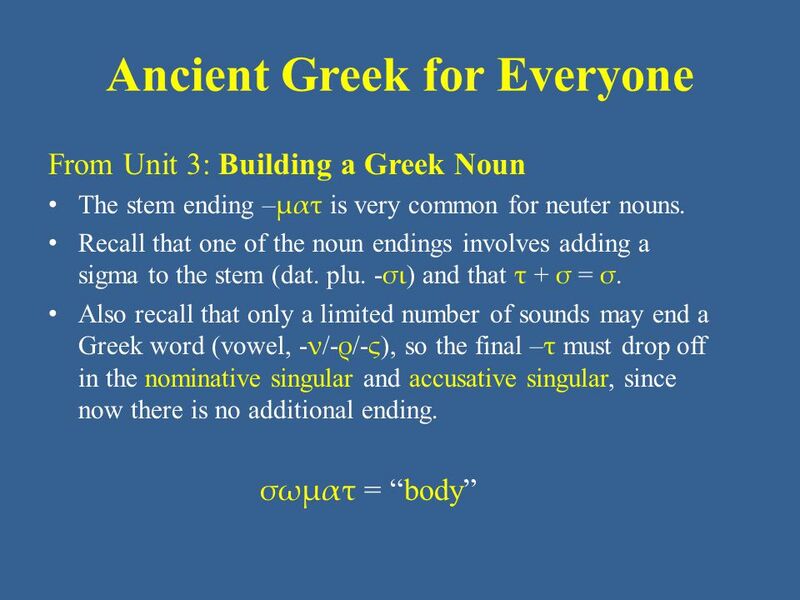 14 Ancient Greek for Everyone New: Building a Greek Noun • This unit adds nouns whose stem ends in - ρ. 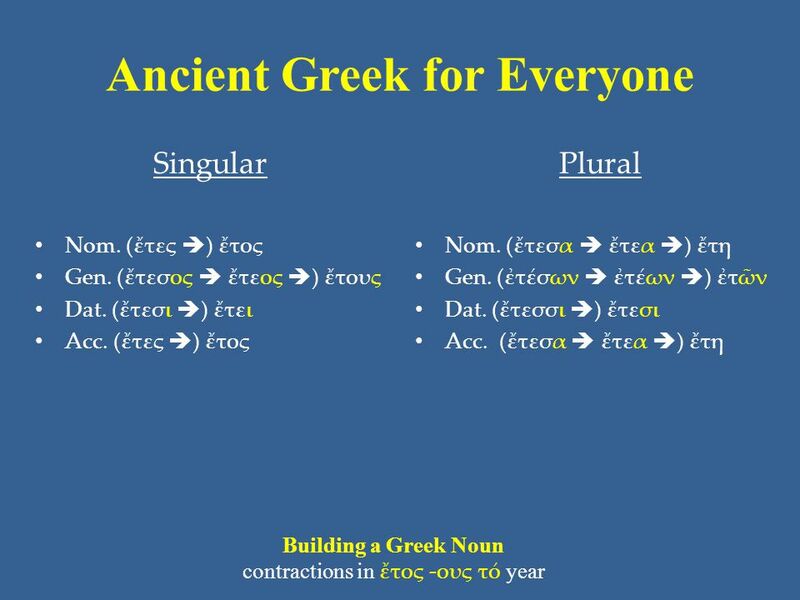 • Greek often avoids the combination - ρσ -, so the - ς always drops from the Nominative singular. 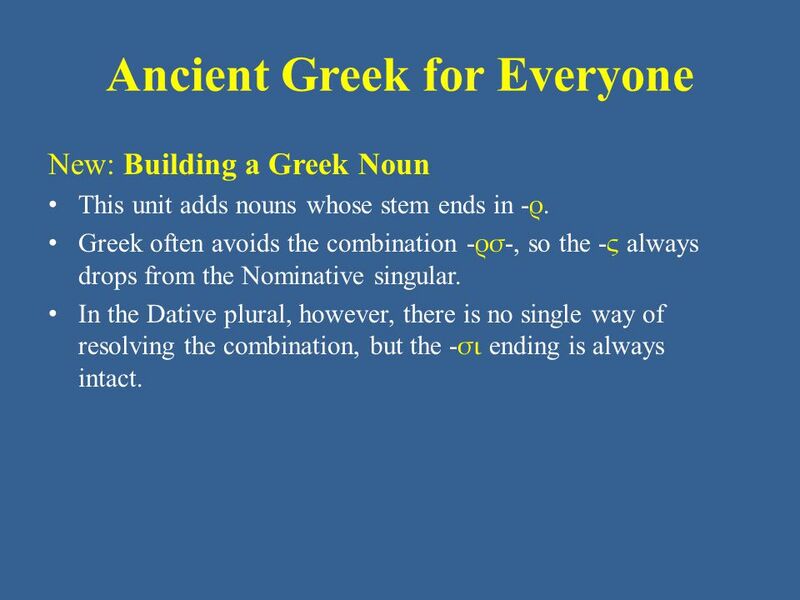 • In the Dative plural, however, there is no single way of resolving the combination, but the - σι ending is always intact. 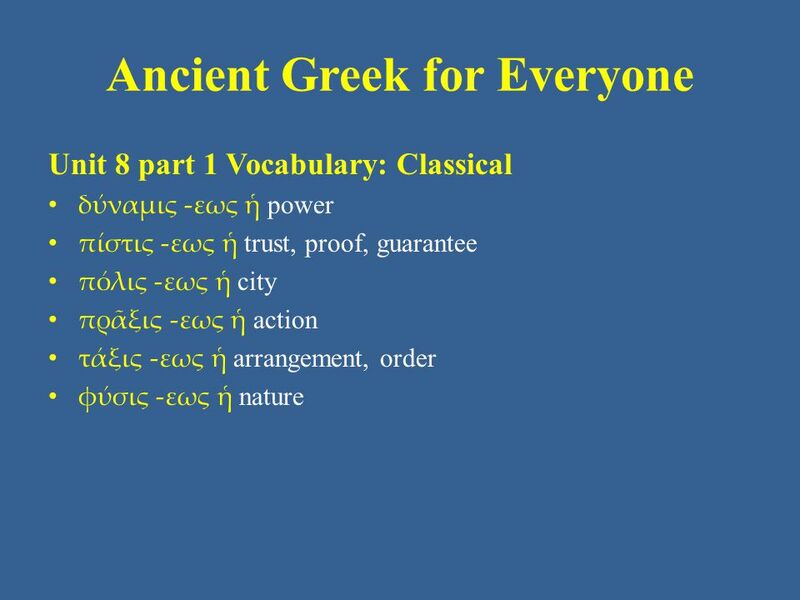 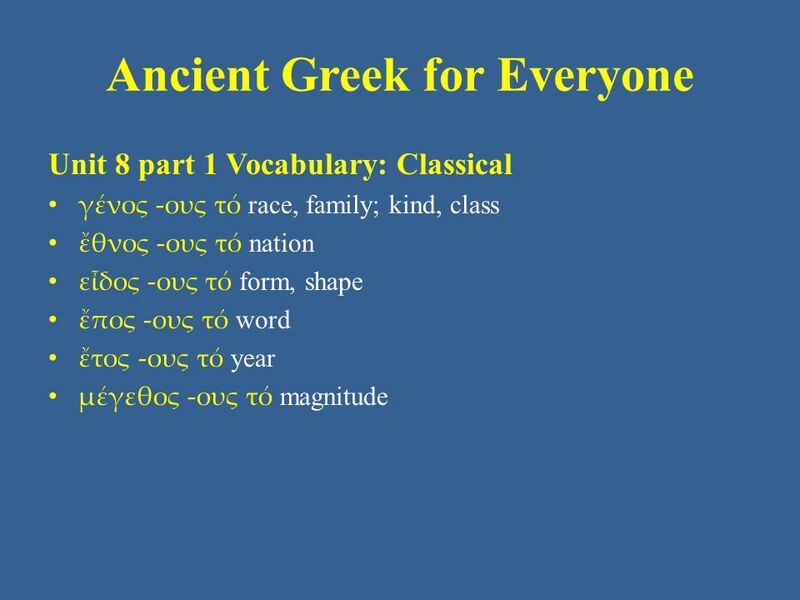 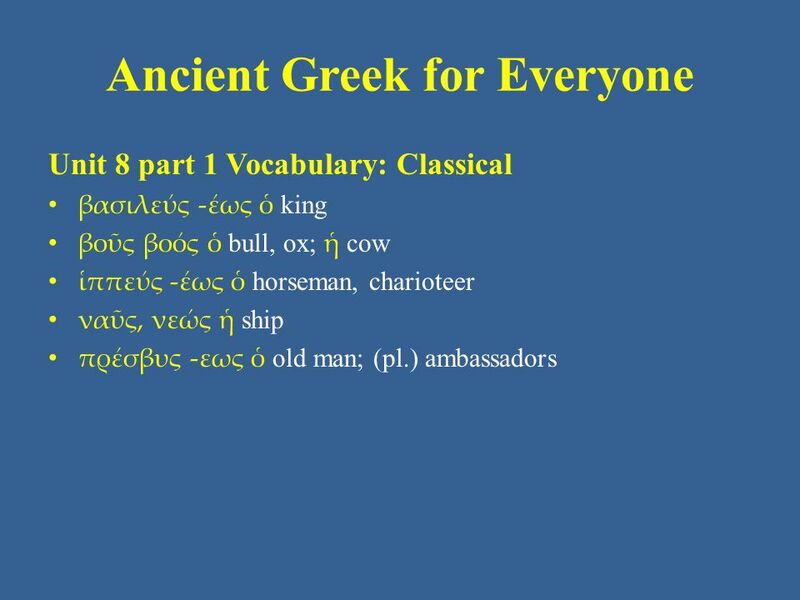 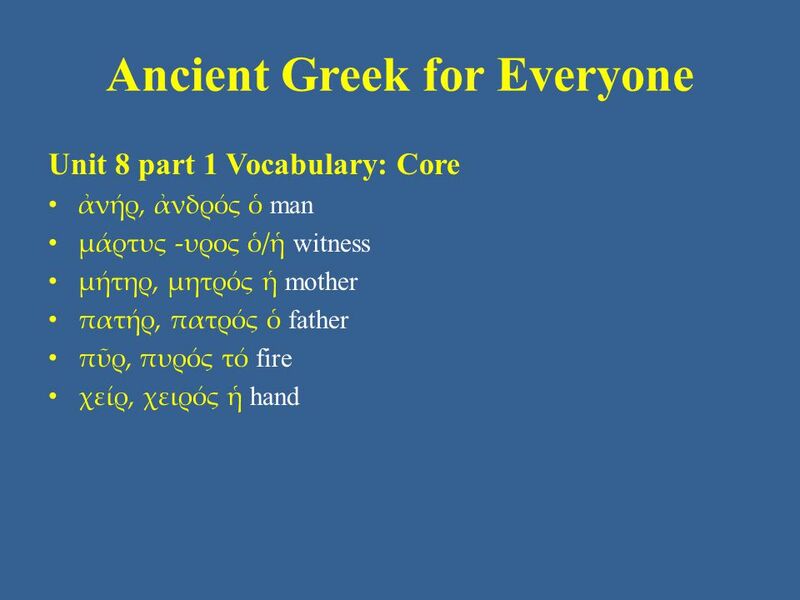 15 Ancient Greek for Everyone New: Building a Greek Noun • This unit adds nouns whose stem ends in - ρ. 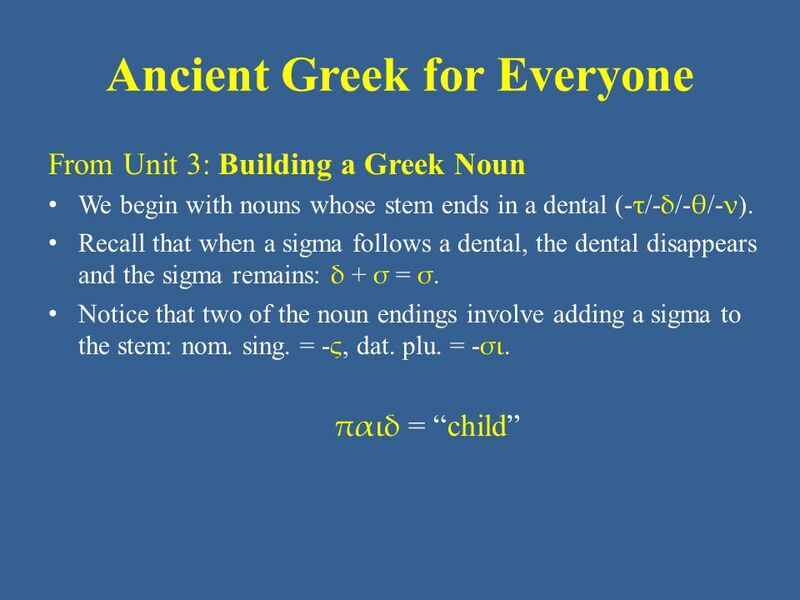 • In the Dative plural, however, there is no single way of resolving the combination, but - σι is always intact. – Some nouns simply allow the full - ρσι - combination. 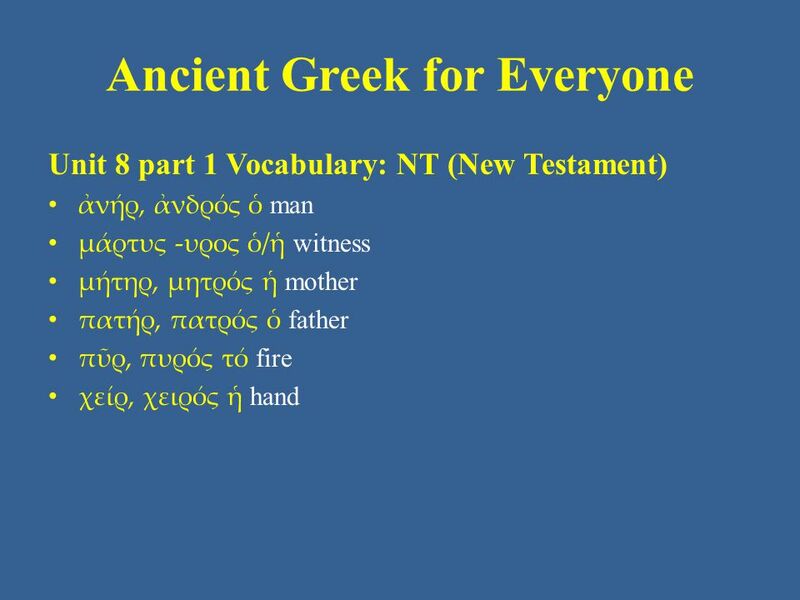 – The noun μάρτυς -υρος ὁ/ἡ “witness” drops the ρ : μάρτυσι – The noun χείρ, χειρός ἡ “hand” shortens its stem: χέρσι – Some nouns insert an - α - between the ρ - and the - σι. 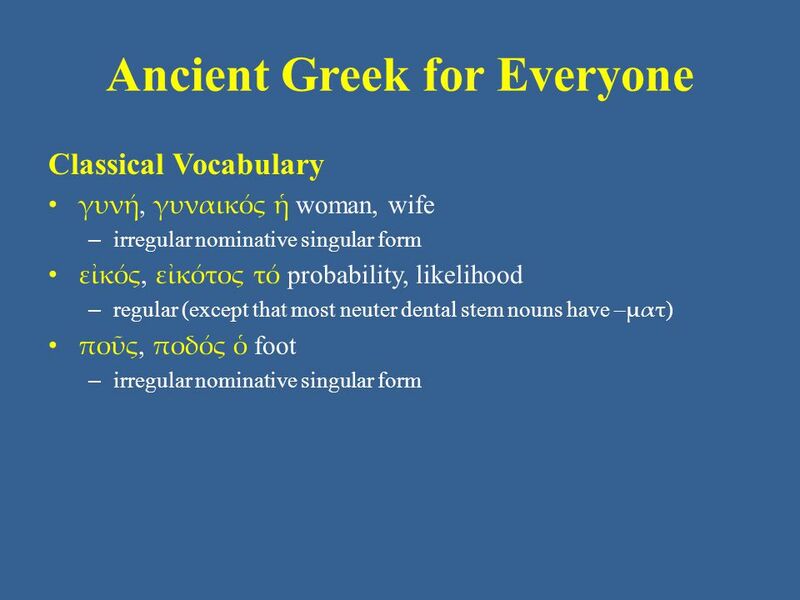 These nouns also show other small stem variations and shifts in accent. 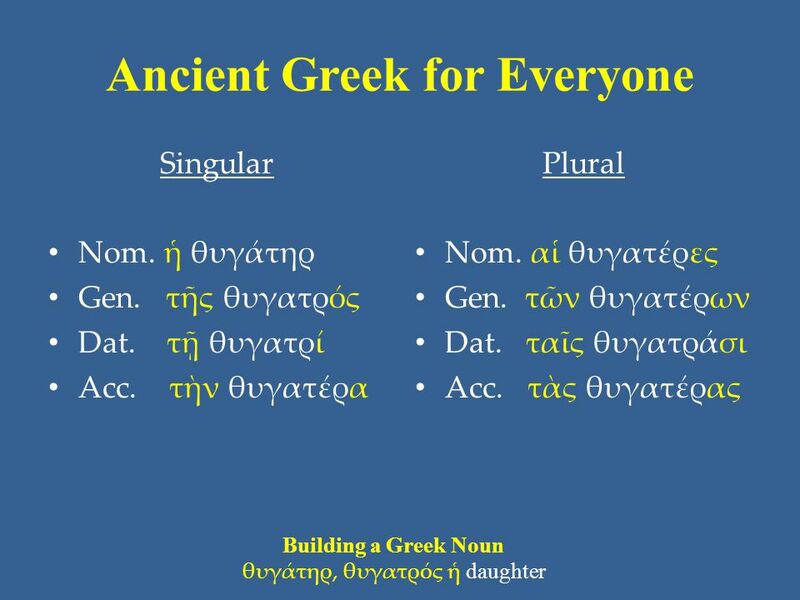 Full declensions of four common nouns of this type (all on your vocabulary list) follow on the next four slides. 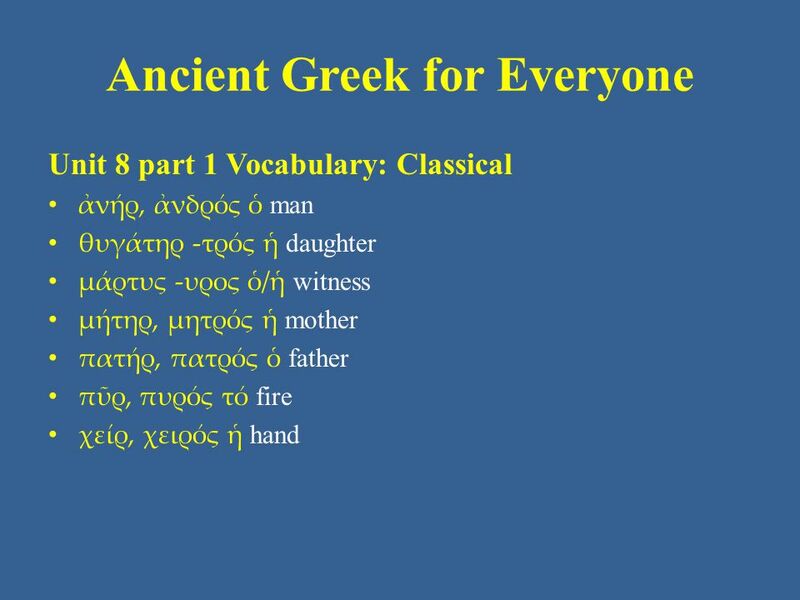 The good news is that the variations do not change the basic case endings. 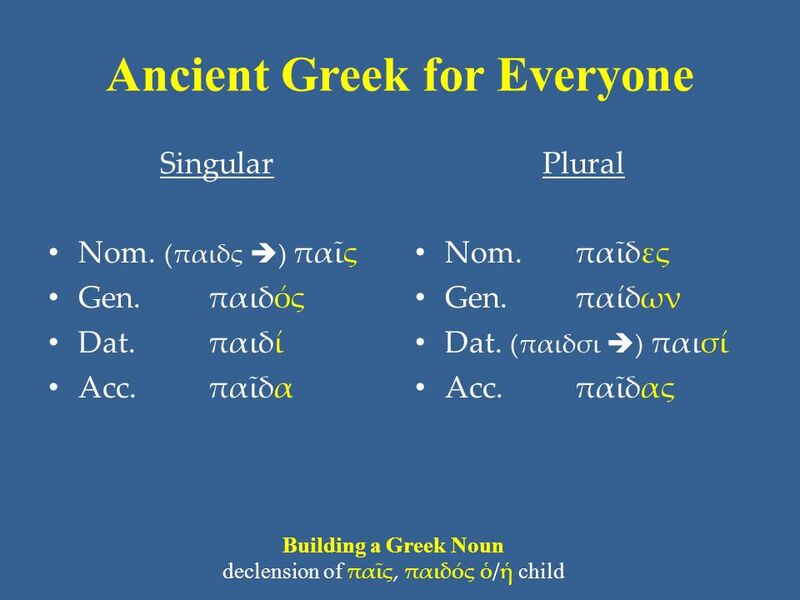 30 Ancient Greek for Everyone New: Building a Greek Noun • This unit adds nouns whose stem ends in - ι, which flattens to - ε in many forms, resulting in some contractions and other variations. • The Genitive singular ending lengthens from - ος to - ως. 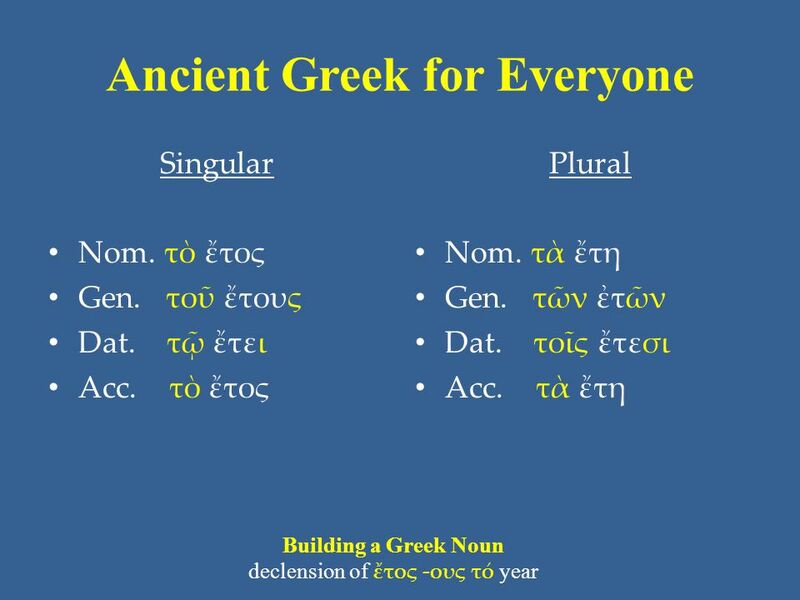 • The Accusative singular uses - ν (familiar from the definite article) instead of - α. 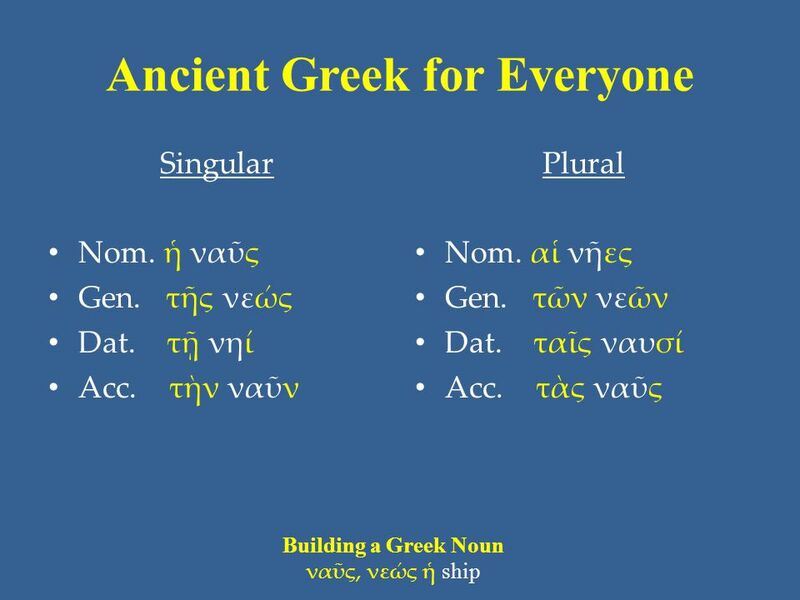 • The Nominative and Accusative plural both contract to - εις. 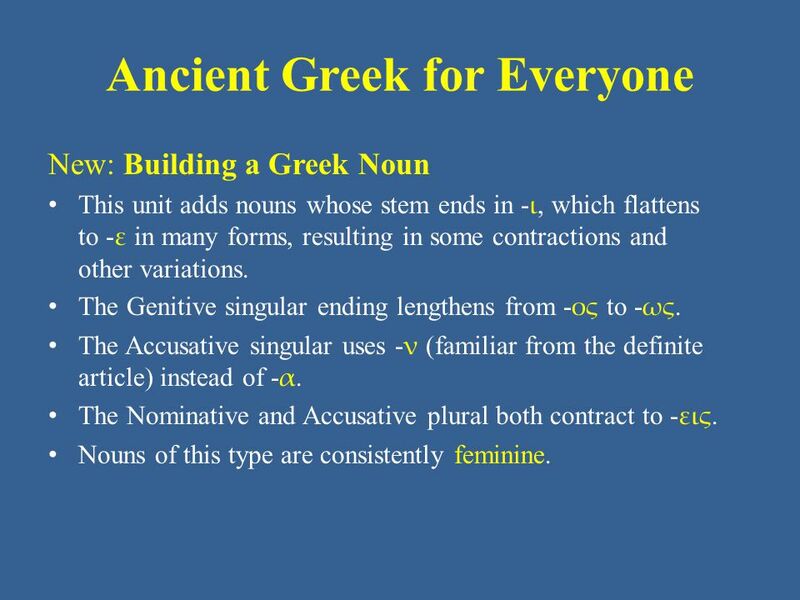 • Nouns of this type are consistently feminine. 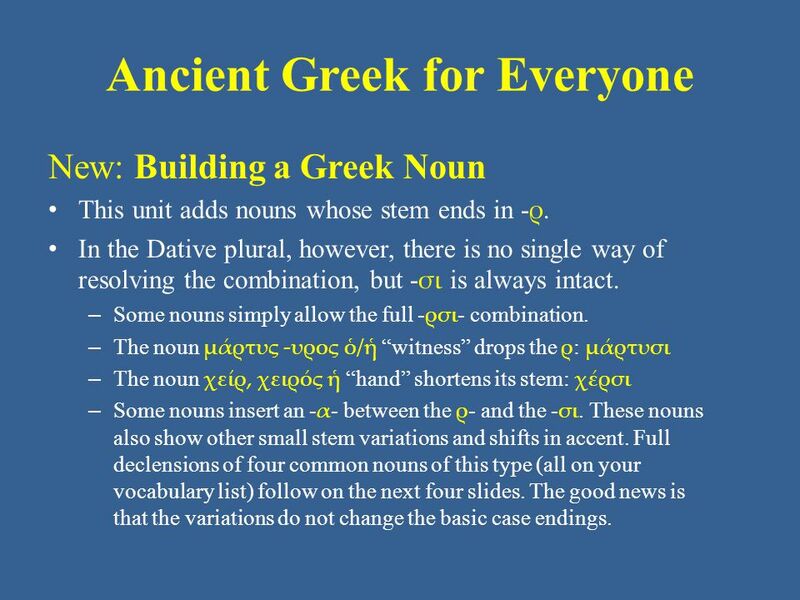 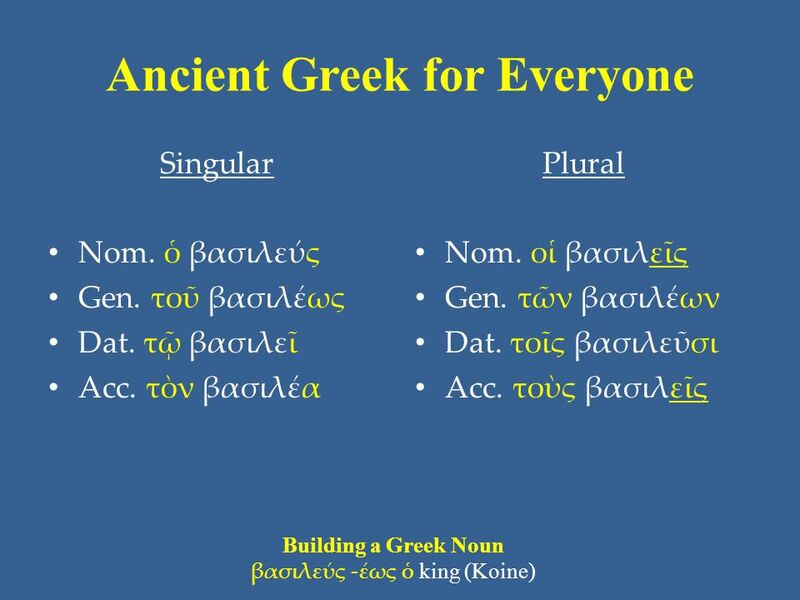 35 Ancient Greek for Everyone New: Building a Greek Noun • This unit adds nouns whose stem ends in - υ, which drops out many forms, resulting in some contractions and other variations. 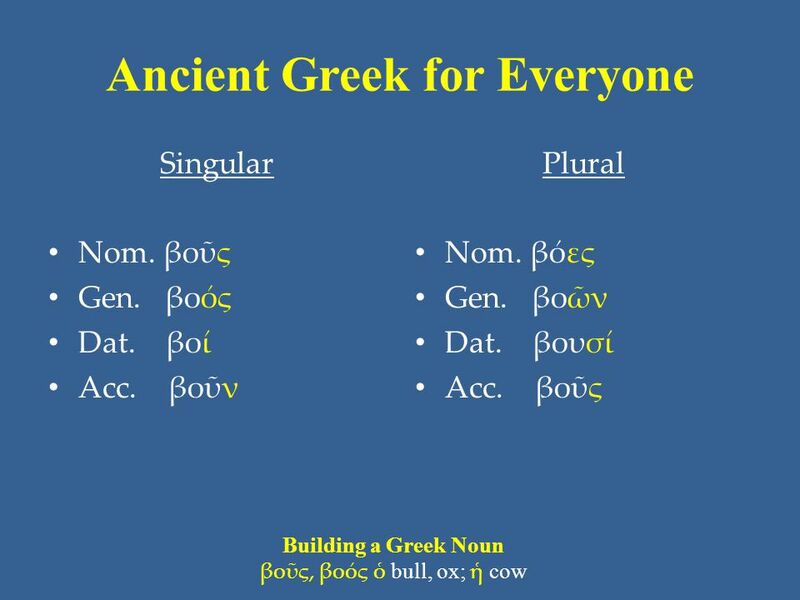 • Greek speakers and writers of different places and times spelled some forms differently, depending on how they pronounced them. 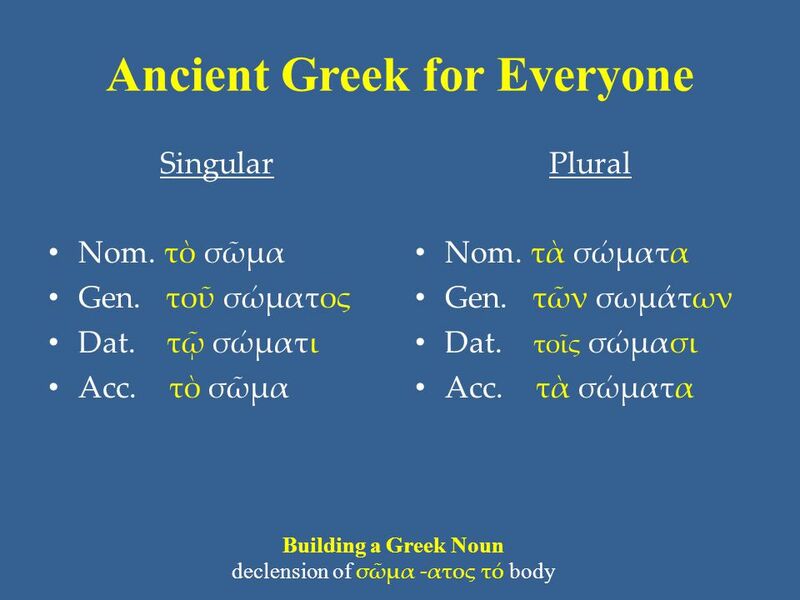 The variations differ in quantity or contraction, but, generally speaking, they are ones familiar from the nouns that you have already studied. For example: – The Genitive singular may lengthen from - ος to - ως. 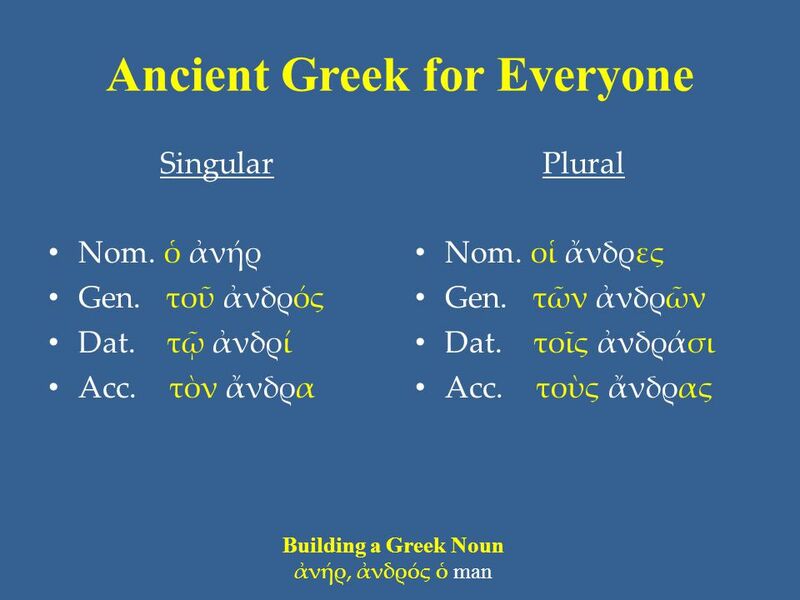 – The Accusative singular may use - ν instead of - α. – The Nominative and Accusative plural might or might not contract. 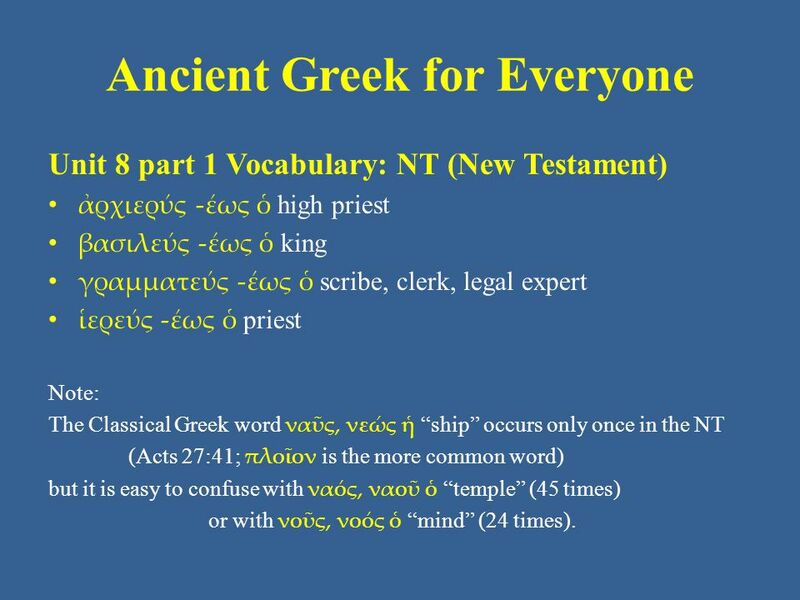 41 Ancient Greek for Everyone Unit 8 part 1 Vocabulary: NT (New Testament) • ἀρχιερύς -έως ὁ high priest • βασιλεύς -έως ὁ king • γραμματεύς -έως ὁ scribe, clerk, legal expert • ἱερεύς -έως ὁ priest Note: The Classical Greek word ναῦς, νεώς ἡ “ship” occurs only once in the NT (Acts 27:41; πλοῖον is the more common word) but it is easy to confuse with ναός, ναοῦ ὁ “temple” (45 times) or with νοῦς, νοός ὁ “mind” (24 times). 43 Ancient Greek for Everyone New: Building a Greek Noun • All the nouns from this part and from Unit 3 belong to a class of nouns normally called the Third Declension. 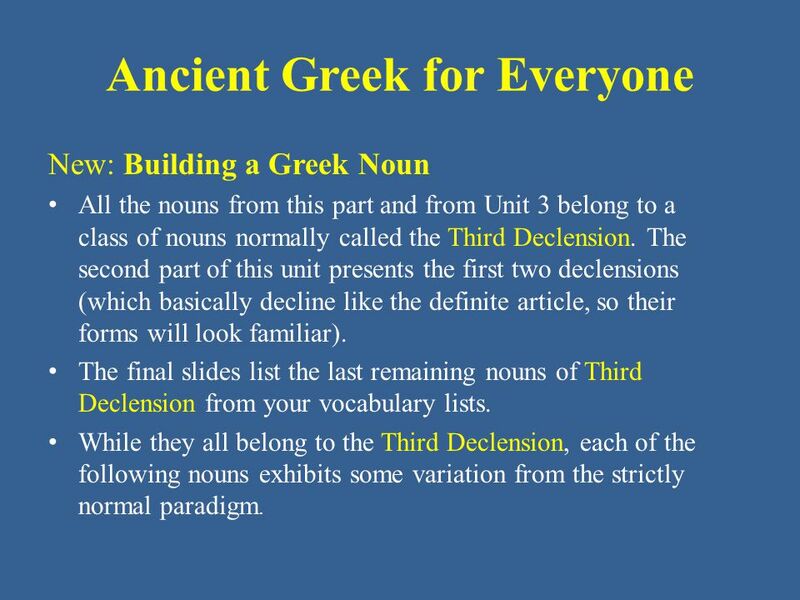 The second part of this unit presents the first two declensions (which basically decline like the definite article, so their forms will look familiar). 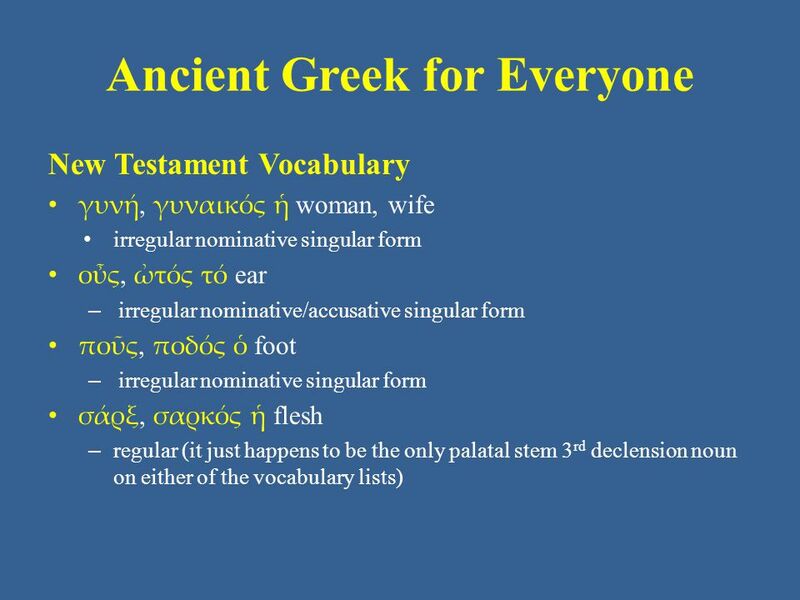 • The final slides list the last remaining nouns of Third Declension from your vocabulary lists. 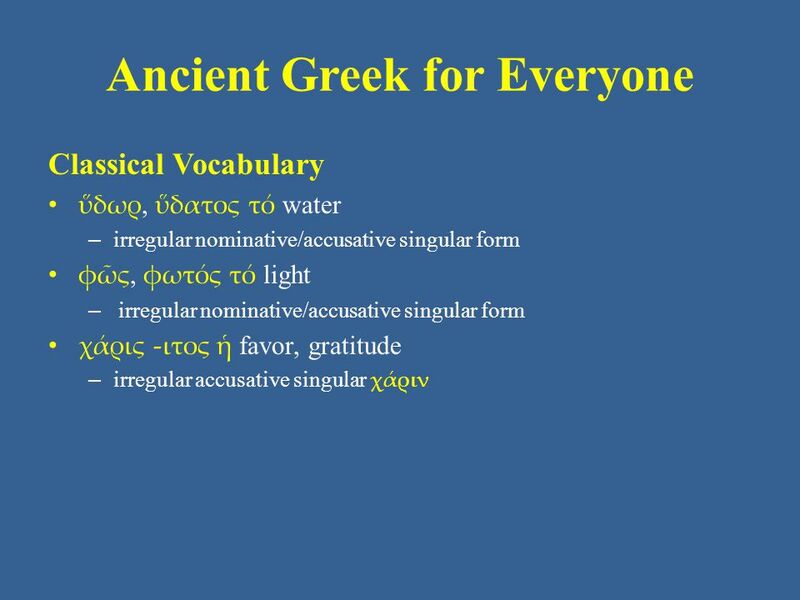 • While they all belong to the Third Declension, each of the following nouns exhibits some variation from the strictly normal paradigm. 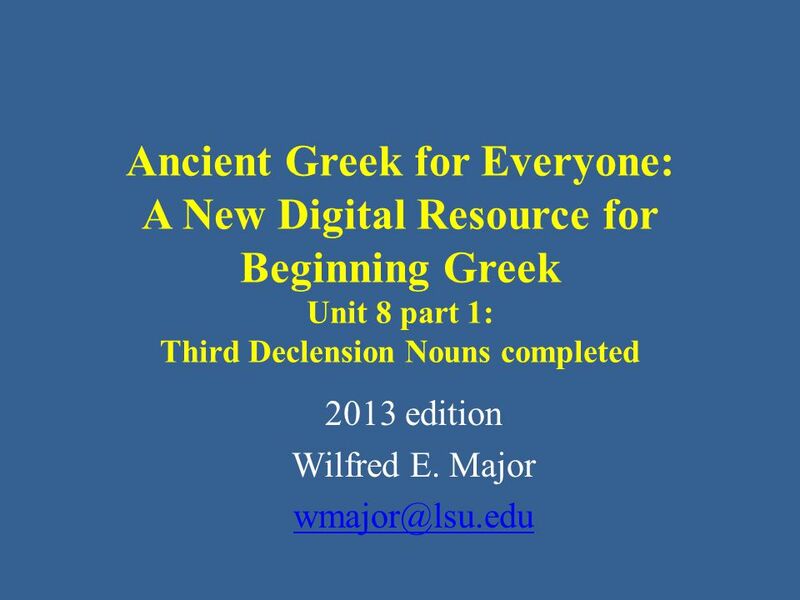 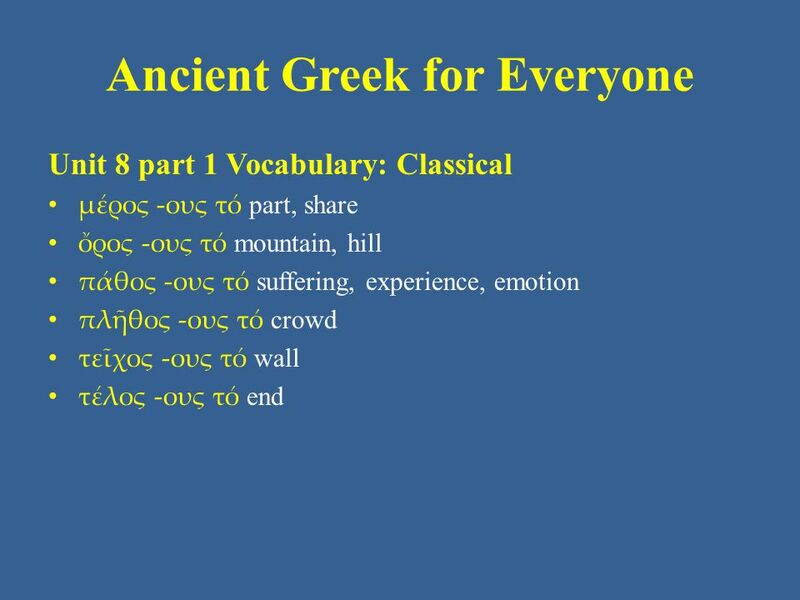 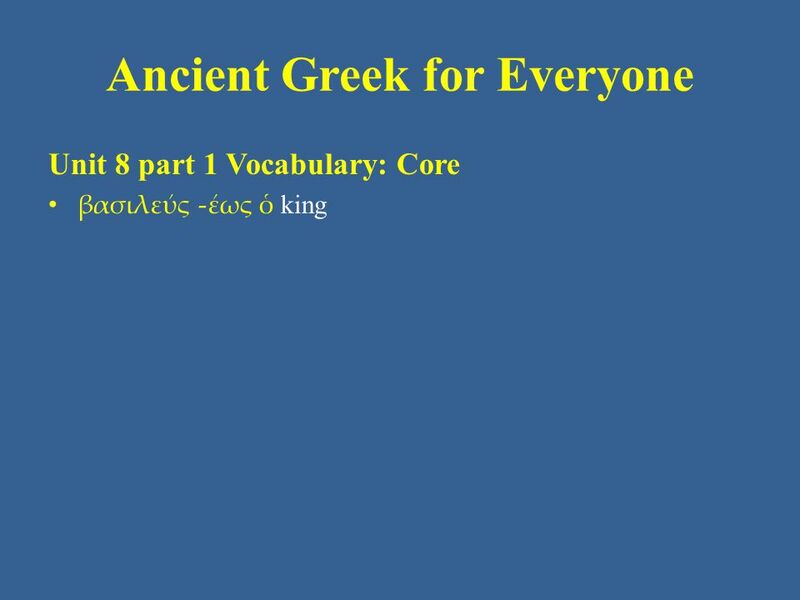 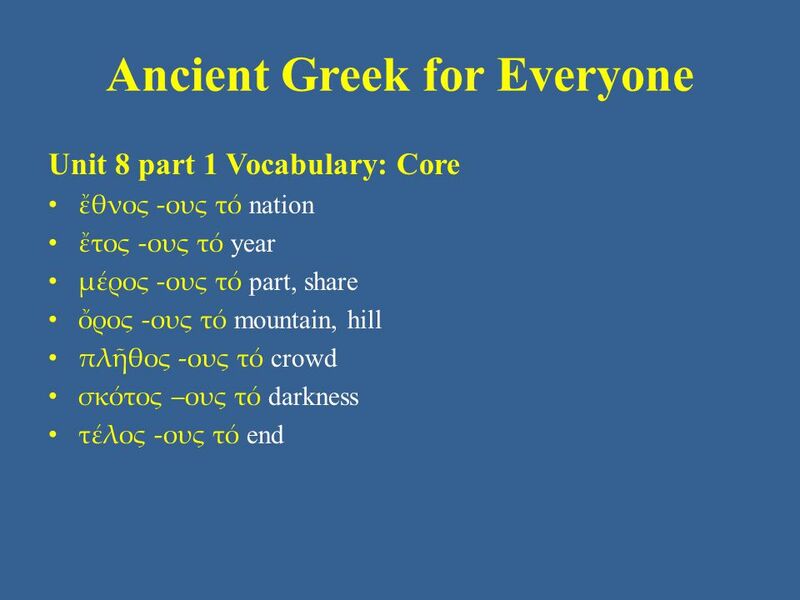 Κατέβασμα ppt "Ancient Greek for Everyone: A New Digital Resource for Beginning Greek Unit 8 part 1: Third Declension Nouns completed 2013 edition Wilfred E. Major"
C.W. 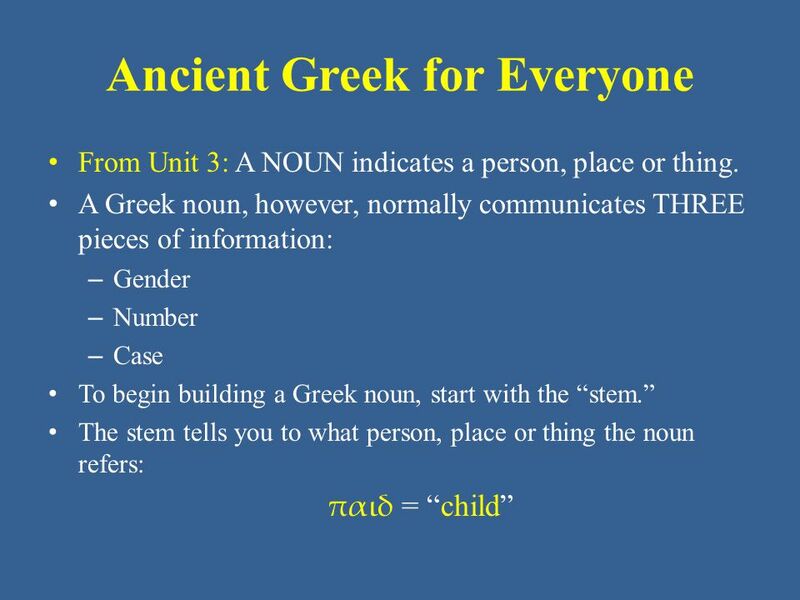 Shelmerdine Introduction to Greek 2 nd edition (Newburyport, MA: Focus, 2008) Chapter 4. 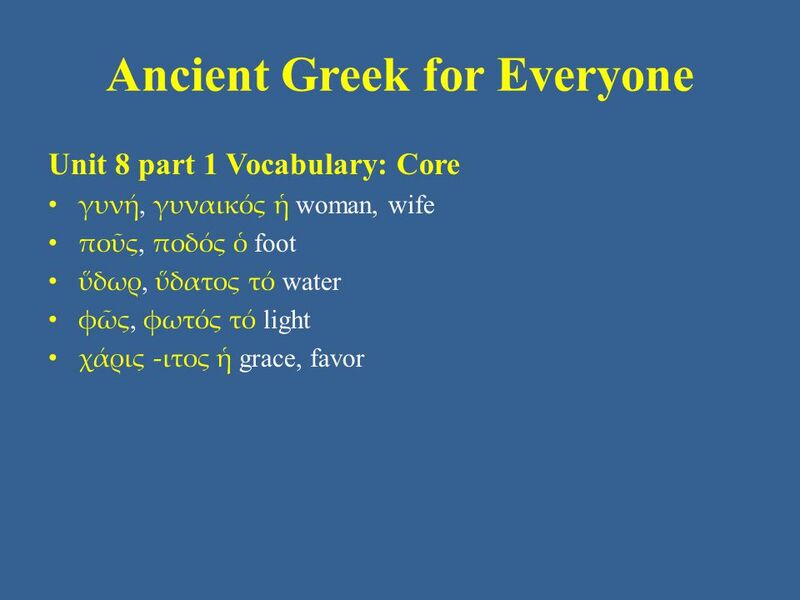 Ancient Greek for Everyone: A New Digital Resource for Beginning Greek as taught at Louisiana State University Fall 2013 Richard Warga Unit 18: Vocative. 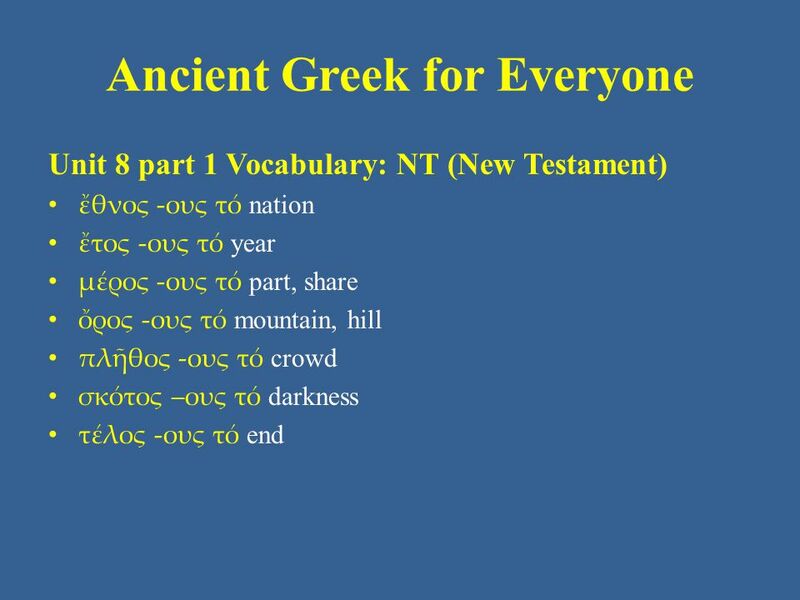 Translation Tips LG1200-50 New Testament Greek Fall 2012.